Mineral Pro’s Whole House Cartridge System is a Point Of Entry ( POE) system, which means it is typically installed on the main water line inside your house and upstream of any outlets. This system is designed for two purposes, first is for sediment removal, second is for reduction of Chlorine taste and odor, and or organic material combined with taste and odor for un-chlorinated water supplies. This is a great multi filtering systems for all residential applications. 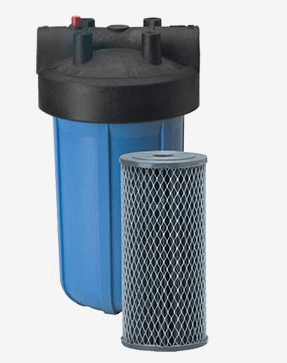 The Whole House Cartridge System can be used in municipal applications that have chlorinated water or in rural areas where water is not chlorinated. When you order this Mineral Pro System , it comes complete with a very heavy duty mounting bracket and required mounting screws so it can be easily attached to a wall, plus the wrench that is required for removing the filter housing to allow for filter washing and replacement, plus a 10 micron carbon-impregnated non-cellulose pleated filter. It is a complete system ready to install on your main line. We choose a pleated filter due to the high dirt holding capacity which adds to the filter life, this pleated filter provides additional surface area with the pleats, and has approximately 18 square feet of filtering material which helps to extends the life of this filter over non-pleated systems. 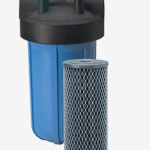 This filter is made of non-cellulose material which makes it resistant to bacterial attack which is really important in selecting a safe option for your filter so you can be assured that you are not growing bacteria inside your filter housing. Being a pleated filter it can also be washed if you have a lot of sediment build up on the outside of the filter. A POE system is a great first step in your filtering needs, not only does it remove most of the sediment in your house system, but has the added advantage of reducing the un-wanted taste and smell of Chlorine and organic materials. Removing the sediment at one central point in the house reduces your maintenance on all your appliances, all the aerators on your faucets, keeps shower heads cleaner – less blockage, reduces dirt build up in your toilet tanks and valves, also reduces sediment build up in your hot water tank, and even keeps your lawn sprinklers working at full performance. We recommend a Whole House Cartridge System for all residential applications. Also makes your RO filters last longer, so ends up saving money on filter replacements. The chlorine reduction in your house water systems is also very beneficial in less chlorine in your cooking, less in your showers and baths. Many people are affected by water that is chlorinated and which can dry out your skin and hair and cause your eyes to be irritated and red after a shower. The cartridge should be replaced annually in order for the carbon to continue to be effective. 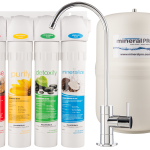 If you have any questions or want to order your very own easy to install MineralPro Water whole house cartridge system call us at 1-855-586-6667 or contact us online.